The diamondback terrapin (Malaclemys terrapin) is one of a few species (actually the only New World) of turtles that are adapted to live in brackish environments. The diamondback terrapin ranges from Cape Cod, MA to Corpus Christi Bay along the Texas Gulf Coast. They exist only along the coastline in water that is a mixture of fresh and salt water. Depending on rainfall and time of year, the salinity (salt content) of the water can be identical to pure sea water, or higher, or close to 50% fresh/salt water. Their main habitats are salt marshes and mangrove waterways. Along the east coast of the United States (from Cape Cod, MA to Miami, FL) they are inhabitants of salt marshes. From the Florida Keys to the Florida panhandle, they live mostly in mangrove creeks and waterways. They again exist in salt marshes from the western Florida panhandle to Texas. There are seven different subspecies (forms) throughout the range. Five of those subspecies can be found within Florida. There are terrapin regulations in all of the range states. Many states forbid the take or capture of them. Diamondback terrapins are protected from commercialization by the state of Florida. They were recently added to CITES Appendix II in March 2013 which will protect them from exportation. A diamondback terrapin is essentially a freshwater turtle that is adapted to live in brackish water. The ornate diamondback terrapin, our local subspecies, has a dark shell with yellow/orange blotches on most of the scutes.Their head, limbs and tail are generally whitish with or without black spots. They have high sexual dimorphism by size. Males are typically 4-5″ in carapace length and females are generally 5-9″. Males have longer tails and usually look half the size or smaller than females. Terrapins were treasured for the meat in the late 1800’s and early 1900’s in the Northeastern United States. They became a delicacy for the wealthy and prices went up to $125 a pound in the 1920’s. Terrapin numbers were heavily depleted along the east coast due to high demand. The Great Depression in the 19030’s crashed the market on terrapin meat and many states started to enact regulations on the harvest of these heavily exploited turtles. 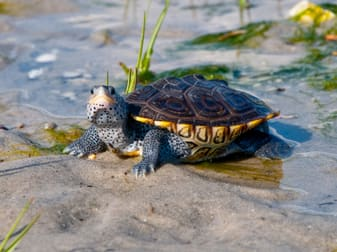 Terrapin populations have been recovering over a half a century along the east coast but another problem has resulted in a slower recovery in some areas. Crab traps (or crab pots), which are used to harvest blue crabs, have unfortunately been shown to cause mortality in terrapins in some areas. They are baited wire boxes that have funnels on all 4 sides and are deployed underwater. Terrapins have been known to enter these traps to eat the bait and subsequently drown if they cannot find their way out of the trap. Terrapin bycatch (accidental capture of a non-target item) in crab pots has been well documented along the East Coast from Massachusetts to northern Florida but is less known from the southern end of their range. Many states have adopted the mandatory installation of a BRD (Bycatch Reduction Device) on all funnels to prevent larger terrapins (mostly females) from entering the trap. There have been proven experiments that show that crab pots catch equal amounts of crabs with these BRD’s installed. Ghost traps (or abandoned crab pots) are the biggest problem because they can continue to capture terrapins for months or possibly years after they are abandoned. Almost nothing is known about terrapins in Southwest Florida. Terrapins have not been researched in Lee, Collier, or Charlotte Counties so this study will be gathering baseline data. The data collected will be used to compare SW Florida populations to those in other parts of the state and for future studies in the area. The project is focused around Pine Island Sound. SCCF has partnered with the Florida Fish & Game Conservation Commission (FWC) and US Fish & Wildlife Service (JN “Ding” Darling National Wildlife Refuge, JNDDNWR) to gather information on these secretive turtles in our area. Permits have been acquired from FWC and JNDDNWR to conduct this work. SCCF biologists in the Wildlife Habitat Management Program department are conducting a mark-recapture study at several locations to assess the current population status and gather measurements on SW Florida terrapins. Turtles captured are marked with scute notching/drilling (Cagle Method) and internal pit tags for future identification (and to thwart possible poaching, including sale and exportation). Another goal of the project is to find nesting areas for terrapins since none are known in our area. We are currently searching for funding to purchase satellite/GPS transmitters so we can track a few females to see where they are nesting. It is very possible that there are one to several communal nesting areas where terrapins are migrating to. The most important goal of this project is their conservation in Southwest Florida. By gathering this data, we will be able to start to learn about their ecology and future survival needs. If you are interested in helping with this project, please let us know. We are looking for sponsors to help with the costs of the mark-recapture study and the telemetry project. If you see a terrapin in Southwest Florida, please try to take a picture and notify us at 239-472-3984 or email terrapin@sccf.org.